My children were not very good at cleaning up after themselves. One day, when I walked through the family room with a basket of laundry, I tripped over one of their toys, slammed my foot into the bottom of the sofa, and broke my toe. I was the grouchy mama! This experience was the inspiration for That Mama is a Grouch. 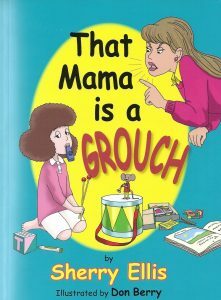 The grouchy mama is very much how I used to be when my children were young. I think a lot of moms can relate. And the child is typical of many young kids. What they look like and how they react to things was the illustrator's interpretation. and said, "Clean up you mess!" that Mama is a grouch. Sherry Ellis is an award-winning author and professional musician who plays and teachers the violin, viola, and piano. When she is not writing or engaged in musical activities, she can be found doing household chores, hiking, or exploring the world. Her other published works include Bubba and Squirt's Big Dig to China, Don't Feed the Elephant, Ten Zany Birds, and That Baby Woke Me Up, AGAIN! Ellis, her husband, and their two children live in Atlanta, Georgia.